22 July 2012 - Richmond, VA - The Virginia Tour contested the third of three weekend 54-hole tournaments on course # 2 at the immaculately-maintained Richmond, VA Putt-Putt Fun Center. The event served as a final tune-up for the 2012 PPA Eastern Open, which will be held on Richmond's course # 2 layout on the weekend of August 11-12. Significant overnight rainfall dampened the course's carpets prior to the 10:00 a.m. tee-off time, leading to a bevy of low scoring. 2003 PPA National Champion Robert Johnson took full advantage of the ideal playing conditions, continuing his stellar 2012 PPA season play by posting a brilliant 54-hole score of 66 for a three-stroke victory. Action began with a pair of fine gentlemen, reigning PPA Southern Open Champion Danny McCaslin and 1997 PPA National Champion Randy Reeves, ascending to the top of the opening-round leaderboard at 22. At 23, Johnson and Richmond local stalwart Ken Schooler lurked just a stroke behind the co-leaders. Reeves continued his torrid pace in the second round, firing a second-consecutive 22 to establish the 36-hole lead at 44. Johnson and McCaslin stood just one shot off of Reeves' lead at 45, with Schooler hovering in fourth position at 46. As Reeves and McCaslin struggled in the event's closing round, Johnson took command with a tournament-low final-round 21 to complete the day with a 54-hole total of 66 and earn his sixth win of the 2012 PPA season. Jeff Spainhour matched Johnson's final-round 21 to pole-vault into second position at 69. At 71, defending champion Rick Shelton completed an impressive weekend performance with a third-place finish. 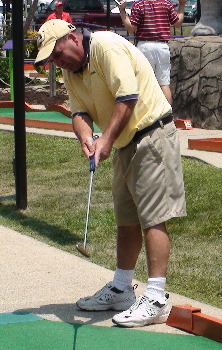 A three-way, fourth-place tie at 72 included McCaslin, Schooler, and 1987 VA Open Champion Terry Phillips. The final of the eleven cash spots awarded in the professional division fell at a 54-hole total of 74, which was a four-way split of the final three money spots. In the amateur division, defending champion Mike Matthews finished with a flourish to successfully defend his title in dramatic come-from-behind fashion. With a first-round 23, Matthews maneuvered into a tie for the opening-round lead with 1999 Eastern Open APA Champion Donnie Carpenter, who Matthews defeated in a playoff in the previous day's second tournament. Carpenter wrestled the lead from Matthews after two rounds, firing 24 to set the 36-hole amateur pace at 47. After a second-round 24, Matthews fell to second position at 48, with 2010 APA National Champion Joey Graybeal remaining in contention at 49. Matthews seized control of the tournament with a closing-round 21, the low round of the event in the amateur division, to notch a three-stroke triumph with a 54-hole score of 69 and capture his third win of the 2012 season. Graybeal shot a third-round 23 to earn second-place honors at 72. With a final-round 22, 2004 JPA National Champion John Petrie moved into third place at 74. Similarly, two-time APA National Doubles Champion Malcolm Shumaker jumped into fourth position at 75 with a closing 22. Suffering a final-round 29, Carpenter precipitated into fifth place at 76. The last of the six amateur division expense reimbursement spots distributed in the tournament came at a three-round total of 77. The Virginia Tour wishes to thank course manager and host professional Gary Hinshaw, his wife Patsy, and the course staff for warmly welcoming the tour to the beautiful Richmond, VA Putt-Putt Fun Center for a weekend of successful tour events. Players look forward to returning to Richmond on the weekend of August 11-12 for the PPA Eastern Open. 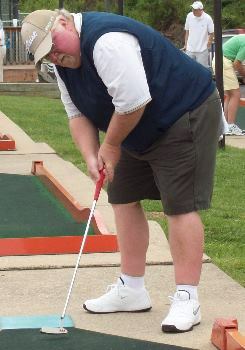 The Virginia Tour schedule will resume on the weekend of August 25-26, 2012 on the newly-revamped course # 1 at PPA Commissioner Joe Aboid's Lynchburg, VA Putt-Putt Fun Center. Two 54-hole events will be held on Saturday, August 25. The first of those tournaments will commence at 11:00 a.m., with the second of those events scheduled to begin at approximately 2:30 p.m. The VA Tour's fourth major tournament and final event of the 2012 season, the 108-hole VA State Championship, will tee off at 9:30 a.m. on Sunday, August 26.